Background: Dyeing of textiles and textile substrates has been known since ancient times. Now the increased awareness about natural products, use of eco-friendly products has been increased worldwide. Natural colorants from wastes may be the eco-friendly alternate towards this approach of finding new sources of colorants with simultaneous lowering of environmental pollution. Marigold is one of the wastes discarded, particularly in India after using for religious purposes or garlands. This study is a step towards waste utilization for industrial application. Methods: Extraction of natural colorants (carotenoids) from marigold flowers was carried out and characterized via UV/Visible and FT-IR spectroscopy. Mordanting of wool by three mordants; alum, iron and tin is followed by dyeing of wool fibers by marigold dye. Dyed wool fiber samples were tested for colorimetric and fastness properties. Results: Spectroscopic techniques (UV/Visible and FT-IR) established the final structure of carotenoids, the coloring compounds in Marigold. Marigold dye imparted yellow colored shades on wool. Colorimetric results are excellent in terms of exclusivity of the shades by application of various mordants. Fastness results in terms of washing, light exposure and rubbing were found in practically acceptable range. Conclusion: Dyeing potential of marigold was evaluated. Production of large range of shades with good colorimetric and fastness results on the application of mordants and their combinations successfully evaluated. Mordant combinations used in this study have not been found with satisfactory results relatively but developed exclusive shades. 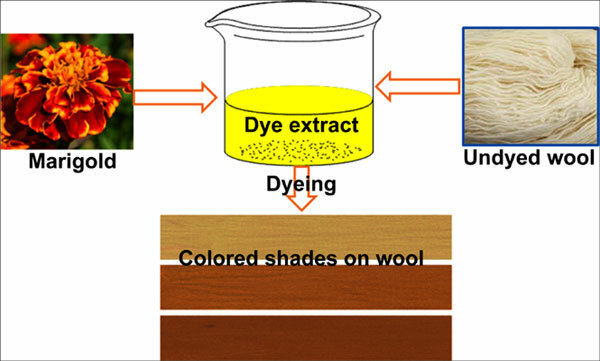 T. erecta natural dye can provide bright hues with good color fastness properties with metallic mordants. Keywords: Carotenoids, mordant, natural dye, Tagetes erecta, wool, coloration. Keywords:Carotenoids, mordant, natural dye, Tagetes erecta, wool, coloration. Abstract:Background: Dyeing of textiles and textile substrates has been known since ancient times. Now the increased awareness about natural products, use of eco-friendly products has been increased worldwide. Natural colorants from wastes may be the eco-friendly alternate towards this approach of finding new sources of colorants with simultaneous lowering of environmental pollution. Marigold is one of the wastes discarded, particularly in India after using for religious purposes or garlands. This study is a step towards waste utilization for industrial application.